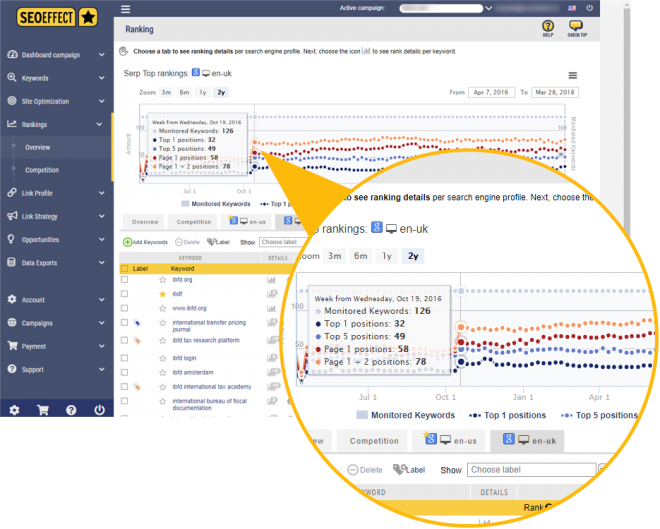 For large campaigns: look back in your rankings over two years. A nice feature if you want to better understand the trends or seasonal influences of a keyword or keyword group. The bonus is that these extra rank data are immediately available, provided you have been collecting data for more than one year of course. View the ‘spam flags’ that determine your spam score. They are now also available in the link profile of your own site and that of your competitors . Hover over the ‘SP score’ to see them. As you can see in the screenshot above, without the 2 years rank history, you would have missed the rank leap on October 19 2016. Before this update we only could look back 1 year. In this case until March 2017. We see, looking back back over two years, that each year the rankings improved in the spring improved but deteriorated in the summer? Why was there always a better score in the spring? It appeared that, at the end of spring, the urls of the product pages where updated to the latest versions, which changed the URL’s but 301 redirects where omitted. In the 3 months view we could see that we just started to score for a keyword. But when we looked back over 2 years, we found that this keyword already scored much earlier and also better another page that no longer existed. How do access the 2 year rank history? Click on ‘2y’ button above the rank graph. If this button is inactive, this is because your campaign type is not ‘large’. You first have to upgrade to be able to see your two year rank history. If you have a free, small or medium campaign and it has been running for more than a year, you can also look back over two years straight when you upgrade your campaign to large!